Each week during the growing season, more than 1600 Chicago area families receive deliveries of biodynamic, organic vegetables and herbs from lifelong farmer John Peterson’s Angelic Organics, one of the largest Community Supported Agriculture farms in the United States. But beyond growing crops, for more than 45 years John’s farm has served as a mecca, hosting community picnics, festivals of art and fire, open mic nights, farm field days and educational programs. Inspired by the sense of community provided by such events, John and his wife Haidy have been working to creatively adapt the property to accommodate people by designing lofts, outbuildings and outdoor spaces that are conducive to vibrant community and artistic life and integral to the social organism of the farm. 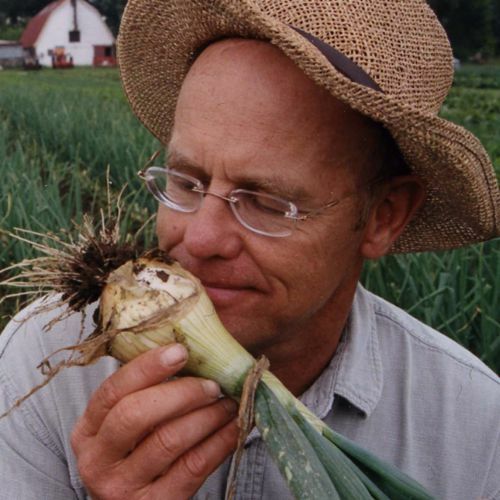 In addition to sharing his farm, John has shared his life through theater, film and writing. His lifelong passion for farming is the perfect backdrop (and sometimes foreground) for the dramatic stories of the world he inhabits. The narrator and subject of Taggart Siegel’s feature documentary The Real Dirt on Farmer John – an award-winning film seen by millions. John also produced, directed and acted in Resolution, a play about the U.S. farm crisis which played over forty venues in the midwest, and designed and taught a workshop, The Art of Neighboring, that was used as a catalyst to create farm support groups throughout Illinois. He has performed at New York’s Pen and Brush Club and Skep Gallery, Vassar College, Rhode Island School of Design, Beloit College, Cornell College, the Milwaukee Institute of Art and Design and in Chicago, San Antonio and San Miguel de Allende. He also co-directed and co-starred in two music videos, I Used to Bee and The Farmer John Song on Lesley Littlefield’s debut album, Little Songs, and published his first book, Farmer John’s Cookbook, in 2006. He’s currently working on two more books: I Didn’t Kill Anyone Up Here and Farmer John on Glitter and Grease.